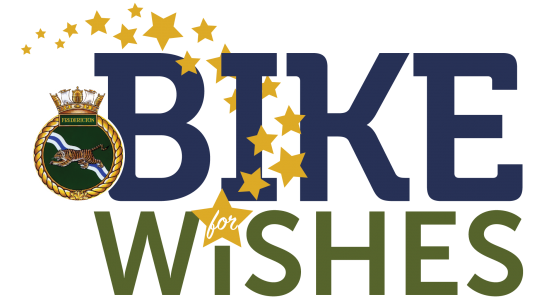 The 9th Annual HMCS Fredericton & Brunswicker Bike for Wishes will follow two routes as they travel across New Brunswick in support of the Children’s Wish Foundation. Click here to follow the team on the Northern Route to find out what activities they will be doing in your area. Beginning in Miramichi the crews stops include Caraquet, Bathurst, Campbellton, Florenceville, Woodstock, Nackawick and Fredericton. Click here to find out more or please go to our contact page to request for the crew to make a stop in your town. Click here to follow the team on the Southern Route to find out what activities they will be doing in your area. Beginning in Sackville the crews stops include Cape Tormentine, Moncton, Peticodiac, Sussex, Quispamsis, Saint John, Oromocto and Fredericton. Click here to find out more or please go to our contact page to request for the crew to make a stop in your town.